Join the thousands of websites online who put trust first to grow sales. 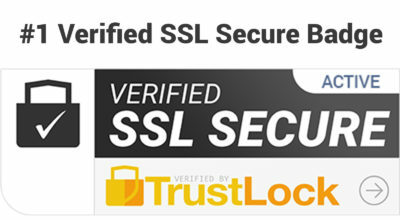 Build your trust, authority, credibility, and sales with TrustLock SSL Secure Verification Badges today. Our second best selling trust badge helps visitors know that your website is actively secured via a valid SSL connection. The Verified SSL Secure badge by TrustLock shows your shoppers that you take security seriously. Perceived security is a huge deal these days - especially in regards to SSL. When you display the SSL badge your visitors will know that your site has been actively accessed via an SSL (Secure Socket Layer) connection. Since security is such an internet hot-topic, this badge helps your visitors know that you take visitors security seriously through an SSL secured connection. Most shoppers won't take the time to look up in the browser and see if they're really connected via HTTPS / SSL, but this badge does that for them when you use the Java embedded code. Our Java-based SSL Verification manually verifies the SSL connection on each page load within the browser, so the badge function alone will help increase visitors security vs. perceived security alone. When the Verified SSL Secure badge by TrustLock is strategically placed on landing pages and footers, it can greatly increase perceived security which is hugely important in today's online world. When your shoppers feel comfortable with the security measures you've put in place, they'll be much more likely to enter credit card details, or purchase products or services! We’ve extensively tested our badges with various text options and after careful internal research realized that the simple words “Verified SSL Secure” was the best phrasing possible to increase perceived security by visitors. While other brands rely on visitors assumptions that their brand name and logo = security, we combine both elements by listing the exact verification title 'Verified SSL Secured' with our tried and true brand name 'TrustLock' for a truly effective trust badge design. After testing several badge phrases, we quickly realized that everyone understands ‘verified SSL Secure’ far more than a generic SSL provider logo seal or brand text alone. Other security verifications are costly, but our solution is effective, affordable and functional. By using your existing SSL Certificate with the Verified SSL Secure trust badge, you won't have to incur paying higher prices for SSL Certificates that are costly, thus reducing your overall cost and increasing your security awareness and perceived security in the easiest way possible. You also don't need to change any internal SSL settings for our badge to work, it verifies itself on each page load without any worry of messing up your existing settings! Our Java and iFrame badge implementations are designed to load last - this way your other pieces of important content are not delayed. Your page should not encounter any detrimental load times after you add our badges. Your page should load at the same speed as normal, and then request our badge verification! When someone clicks on your badge, you’ll have the option of linking this page directly to your own individual TrustLock SSL verification page. Each approved TrustLock subscriber has an individual verification page(s) that also verify the SSL legitimacy by listing the exact SSL serial number used on your site. These pages are publicly available and help you promote transparency so people know that your SSL certificate is valid and real. As an added bonus all Verified SSL Secured TrustLock members receive backlinks from your SSL Verification page on our site! When your visitors hover over any badge with their curser on your site when using Java implementation, they’ll see an expanded understanding of your SSL Secure verification criteria, furthermore giving greater context to your SSL Secure verification. If you opt for the iFrame implementation option, a separate hover effect is employed that doesn’t expand outside the frame itself. These various hover effects are optional and available to all TrustLock SSL Secure subscribers. We strive to give our Verified SSL Secure subscribers the best value possible by providing more badge designs and options than any other trust badge company offering verifications on the market today. Our other badge designs use the same similar phraseology and concepts used in the success of our original badge. Our badge options give you the flexibility of choosing a badge that fits perfectly with your specific landing page or website! Our badges are configured to work on any platform. Whether your site is built on WordPress, Shopify, Squarespace, BigCommerce, Click Funnels or another platform, our badges should configure perfectly! If your site doesn’t support Java badges we have iFrame badges and even image-only badges to suit any platform, website or landing page. Please note that if you opt out of using the Java implementation for the SSL Verified Secure badge, the internal verification on each page load will not function - you must verify your SSL details are correct and may still display the badge in image form. If you still have questions about this, please contact us. Our robust servers have the power to handle millions of badge loads. Although this may cost us more, you will never be charged more if your site gets more traffic. When you get TrustLock, you get unmetered and unlimited use! Our badges were designed in a way that they can be combined together in any way and still be mobile friendly with your design. If you have any issues, just leave us a support ticket and we'll make sure your site is looking 100% perfect on mobile and desktop versions of your website! We make it simple and easy to get started - most users install their badges in less than 5-minutes. Essentially all you have to do is create your desired badge, save it in your dashboard and then copy the code anywhere you want the badges to appear. We can assist you in inserting the badges if you feel uncomfortable editing code yourself. You get unlimited support from our team of technicians! We want to make sure that you are completely satisfied, that’s why we’ve made your TrustLock purchase risk-free. Most of our users see a significant boost in trust which translates into sales. However, if you discover that your sales don’t increase, feel free to show us this proof and request a full refund of any charges within 30-days! We’re that confident that you’ll be completely satisfied with your TrustLock purchase! Are you ready to get the Verified SSL Secure Badge on your site? Our SSL Secure verification takes under 24-hours after your website and purchases this badge. If for any reason we can't verify you, we'll seek to resolve the issue or give you a full 100% refund. If you have any questions, shoot us a message. Get TrustLock on your site today! Start with trust and increase your revenue. Don’t take it from us, take it from them.